Over the past few months I have been redisigning the blog and it now includes a new feature whereby it is now accessible on your smart phones. Click on the Blog site address and the HTML will appear on the screen in an appropriate size depending on your make of phone. I hope this will be of use to those parents who use this service. This year's term dates and holidays are contained on the Rhondda Cynon Taff CBC website page. Click on the link here and scroll down the page. There are also the agreed dates for 2013-2014 as well. All schools in the Treorchy Cluster will be involved in staff training today. School will be closed for all pupils on these days. Free School Meals are available for children whose parents or guardians receive certain benefits and entitlements. The Local Authority is responsible for admissions to all schools. Parents are requested to make applications for places in pre-nursery, nursey, reception and to the Comprehensive School. 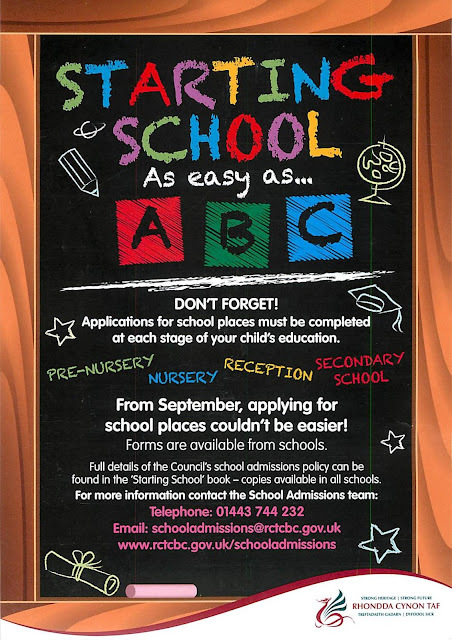 Full details are available in the Starting School 2012-2013 booklet. These forms are available from school or by contacting the admissions team at Ty Trevithick on 01443 744 232 or by e-mail. You can also visit the website www.rctcbc.gov.uk/schooladmissions. Gelli Primary School has very few surplus places and it is advisable to make sure that your form is returned promptly to guarentee your child a place with us.